Notepad: When this puzzle is done, draw a line connecting the 11 circled letters, starting and ending in square #28, so as to spell a phrase related to the puzzle's theme. I am so grateful and amazed that my first published crossword is with the New York Times... and on a Sunday no less. What a place to start! It was during my college years at Vassar that I really got into crosswords, not on campus, but when I'd visit home. It became a ritual that my dad would hoard the Times Magazines so that we could do the Sunday puzzles together when I returned. We'd take turns, and each time I'd try to "crack" the theme before he did. In the beginning, I didn't have a chance at finishing one on my own, but I did so many that soon I was getting the themes before my dad even got a chance to look at them. Solving Elizabeth Gorski's 2013 Secretariat puzzle was a turning point for me. I was completely floored by her ingenuity and wanted to know exactly how she pulled off such a cool trick. So I started looking into what it takes to make crosswords and made a few for fun. Three years later, I found myself with a lot of time on my hands after finishing grad school. I started to wonder about the world of crossword publication and got in touch with Nancy Salomon, who kindly gave me a crash course in puzzle construction. I learned so much from her, and there is simply no way I would be here without her tough love and incredible patience. With her help, I went from struggling to find the right construction software to having this puzzle accepted by Will in just under six weeks. It's been one hell of a ride. I'm very proud of today's puzzle, which honors one of my all-time favorite musicians. The grid went through many iterations, but once I decided on using a phrase as the connection points for the image (instead of alphabetical connectors), it started to come together. I hope you like it!! 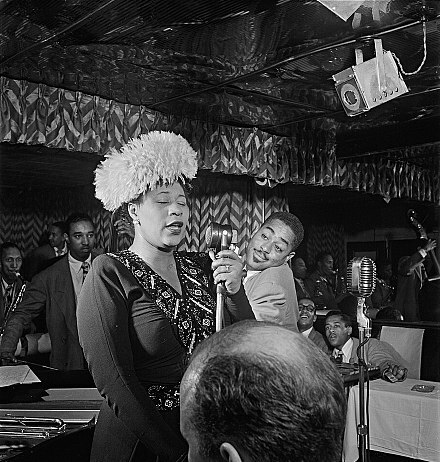 Homage to a jazz great, near what would have been ELLA's 100th birthday. I'm a huge jazz fan, having played in jazz bands for 20 years in my youth; neat to see Ella honored. Love that I SING LIKE I FEEL quote — perfect for someone known for her soulfulness, right up there with Nina Simone. If you haven't listened to her HOW HIGH THE MOON rendition, it's well worth a listen. A TISKET A TASKET is not one of my favorites, but it did help make her a star. A shame that IT DON'T MEAN A THING didn't make the cut. One of her best performances. Tribute puzzles can feel like a Wikipedia page, a dry listing of factoids, so I liked the QUEEN OF JAZZ crown visual. I wasn't familiar with this nickname, though — and LADY ELLA was only vaguely familiar — so that took away some of the impact for me. I used to think that dot-to-dot puzzles weren't that hard to make … until I constructed one (coming out later this year). Turns out they're devilish, especially if you need exact placements of certain letters. It wouldn't be hard to build around the letters if the crown were the only factor, but they all must interact with so many themers. As if that wasn't hard enough, Will's max of 140 words means that you have to build the entire grid using fairly long entries! Overall, Olivia does pretty well with this Herculean task — quite a way to make one's debut! Average word length: 5.29, Scrabble score: 571, Scrabble average: 1.54. Puzzle has 11 fill-in-the-blank clues and 6 cross-reference clues.